This article is about the blood vessels. For the vascular system in plant leaves, see Leaf veins. For other uses, see Vein (disambiguation). Microscopically, veins have a thick outer layer made of connective tissue, called the tunica externa or tunica adventitia. There is a middle layer of bands of smooth muscle called tunica media, which are, in general, much thinner than those of arteries, as veins do not function primarily in a contractile manner and are not subject to the high pressures of systole, as arteries are. The interior is lined with endothelial cells called tunica intima. 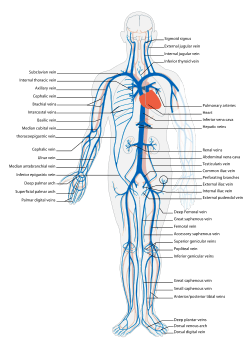 The precise location of veins varies much more from person to person than that of arteries. The return of blood to the heart is assisted by the action of the muscle pump, and by the thoracic pump action of breathing during respiration. Standing or sitting for a prolonged period of time can cause low venous return from venous pooling (vascular) shock. Fainting can occur but usually baroreceptors within the aortic sinuses initiate a baroreflex such angiotensin II and norepinephrine stimulate vasoconstriction and heart rate increases to return blood flow. Neurogenic and hypovolaemic shock can also cause fainting. In these cases, the smooth muscles surrounding the veins become slack and the veins fill with the majority of the blood in the body, keeping blood away from the brain and causing unconsciousness. Jet pilots wear pressurized suits to help maintain their venous return and blood pressure. The decision to treat deep vein thrombosis depends on its size, a person's symptoms, and their risk factors. It generally involves anticoagulation to try and reduce and prevent the size of the clot. The American Medical Association added phlebology to their list of self-designated practice specialties in 2005. In 2007, the American Board of Phlebology (ABPh), now known as the American Board of Venous & Lymphatic Medicine (ABVLM), was established to improve the standards of phlebologists and the quality of their patient care by establishing a certification examination, as well as requiring maintenance of certification. Although not currently a Member Board of the American Board of Medical Specialties (ABMS); the American Board of Venous & Lymphatic Medicine certification exam is based on ABMS standards. The American College of Phlebology (ACP) is one of the largest medical societies in the world for physicians and allied health professionals working in the field of phlebology. The ACP has 2000 members. The ACP encourages education and training to improve the standards of medical practitioners and the quality of patient care. The American Venous Forum (AVF) is a medical society for physicians and allied health professionals dedicated to improving the care of patients with venous and lymphatic disease. The majority of its members manage the entire spectrum of venous and lymphatic diseases – from varicose veins, to congenital abnormalities to deep vein thrombosis to chronic venous diseases. Founded in 1987, the AVF encourages research, clinical innovation, hands-on education, data collection and patient outreach. The ACP is part of the UIP (International Union of Phlebology). The equivalent body for countries in the Pacific is the Australasian College of Phlebology, active in Australia and New Zealand. 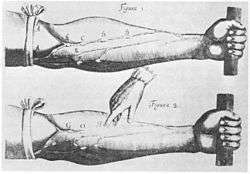 The valves in veins were described by Jacques Dubois, but their true function was later discovered by William Harvey. ↑ Albert, consultants Daniel (2012). Dorland's illustrated medical dictionary. (32nd ed.). Philadelphia, PA: Saunders/Elsevier. p. 2042. ISBN 978-1-4160-6257-8. ↑ Kienle, Alwin; Lilge, Lothar; Vitkin, I. Alex; Patterson, Michael S.; Wilson, Brian C.; Hibst, Raimund; Steiner, Rudolf (1 March 1996). "Why do veins appear blue? A new look at an old question". Applied Optics. 35 (7): 1151. doi:10.1364/AO.35.001151. PMID 21085227. ↑ Maton, Anthea; Jean Hopkins; Charles William McLaughlin; Alexandra Senckowski; Susan Johnson; Maryanna Quon Warner; David LaHart; Jill D. Wright (1993). Human Biology and Health. Englewood Cliffs, New Jersey: Prentice Hall. ISBN 0-13-981176-1. ↑ Kahn SR (August 2006). "The post-thrombotic syndrome: progress and pitfalls". British Journal of Haematology. 134 (4): 357–65. doi:10.1111/j.1365-2141.2006.06200.x. PMID 16822286.